Icy storms were upon us this year making roads quite dangerous to drive on! With one of the biggest threats being slippery and hard-to-spot black ice, it became harder for drivers to gain control causing repair expenses to become a nuisance for fleet organizations. Along with bad weather came the inability to control negative driver behaviours due to negligence. According to Marty Roberts from the Classic Accident Repair Center, the average repair cost this year hovered around $3,900 per vehicle. Proving to fleet management companies that it is important to prepare for hazardous driving conditions and implement solutions that look after you! GoFleet is designed to help operational managers maximize fuel savings and manage driver behaviour effectively. The added benefit of this fantastic solution is the ability to coach drivers in real time, promote preventative maintenance and measure fleet performance all at once. Although the solution is equipped with other benefits, driver coaching and preventative maintenance are two key examples of maintaining operating expenses when driving in hazardous winter conditions. Driver coaching makes it easier to immediately improve on road driving behaviour through in-vehicle audible alerts. The in-vehicle beeps will notify drivers of potentially risky driving habits encouraging them to fix their behaviour immediately. 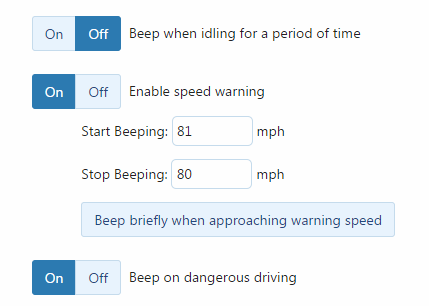 The beeping feature can be customized based on your fleet operating manager’s preference as shown below. Fleet managers can easily develop a fleet-wide safety program that works without intervention. Enable Speed Warning: The device will beep constantly when the vehicle reaches the speed set in Start Beeping, and will not stop until the vehicle slows down below the Stop Beeping speed. The software solution is also capable of showing management information about how well the drivers are performing with the help of Driver Score Card reports.These reports can be set up to be emailed immediately if need be allowing management to compare weekly/monthly/yearly safety improvements. It is evident that some vehicle preparation is required to avoid making outdoor checks in the cold but if that is never off your check list then our solution might just be right for you. With GoFleet’s tracking solution, management can keep track of scheduled maintenance by recording fault codes and engine diagnostics. Managers will have every bit of information needed so, when complications do arise, they will have immediate access to the problem to take immediate action. Remembering when to perform oil changes, rotate tires and other minor vehicle services can be time consuming if you manage more than one vehicle. So, to help with this process the software allows for recurring reminders to be created letting you know when a vehicle is due for service. Organizations often struggle with rising vehicle maintenance costs due to behaviours that could have been avoided if corrected immediately. Monitoring driver behaviour and being able to correct negative habits are two different approaches to management. With our software solution you can view negative driver behaviours and also fix them in real time; allowing your company to maximize savings through reductions in fuel usage and accident liability as a result of improved driver behaviour. It is difficult to absorb unforeseen expenses due to uncontrollable factors such as, frigid winter conditions causing many companies to avoid outdoor routine checks. 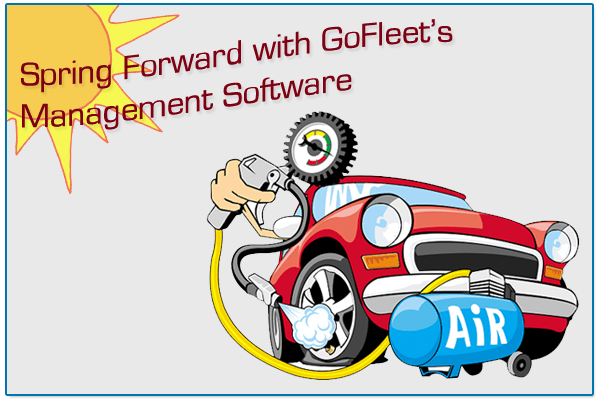 Gofleet’s management software is designed to help stop engine issues before they turn into costly repairs or lead to vehicle down-time by managing your engine fault code information. These vehicle codes explain the engine issue and where to locate it, helping you save on vehicle inspection time and costs. The solution is also future proof with maintenance reminder features to help lower expenses on any vehicle breakdowns. Preventative maintenance helps maintain the health of your vehicle, identify core problems immediately and also offers a higher resale value once a fleet has completed its service life.